Dog Scouts of America: image via dogscouts.orgYou may never have heard of them, but they're in 22 states in the U.S. and there's one in Canada and one in Puerto Rico... chapters of the Dog Scouts of America (DSA). And they don't sell cookies! Founded in 1995 for the purpose of adding enrichment to the lives of dogs and their owners, the DSA chapters offer human and dog members opportunities to bond, socialize, participate in fun activities, support their communities (A Wyoming DSA troop recently raised money to stock 35 fire departments with oxygen masks for dogs! ), and train their dogs. DSA leaders believe very strongly in getting to know your dog, how he thinks, and why he behaves the way he does. Their training methods are strictly reward-based; no form of punishment, such as shock devices, is used to train or motivate canine companions, and members must agree to adhere to these principles. DSA training class: image via dogscouts.orgDSA chapters train dog owners to be responsible pet parents, including how to control their pets' environment so that their dogs don't get into trouble. 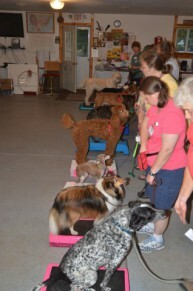 There's a lot of dog psychology in DSA training, but the training is focused more on owners than their dogs. Controlling your dog's environment doesn't just mean the space he is in, but what and who enters that space and how to introduce children and other dogs into that space. Several interesting training tips can be found on the DSA website. DSA trains and certifies detector dogs (scent detectors) as well as draft dogs, dogs used for specific kinds of work, such as hauling. 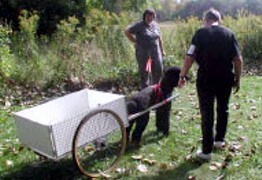 For sport, the DSA teaches dog and owner trail skills, as well as skills to compete in obedience and treiball. Outlines for the training are all available at the DSA website here. There's a lot you can learn about these activities just by reading the online guidebooks. Currently there are three DSA camps in operation - in Michigan, Maryland, and Texas. They are great experiences for bonding with your dog, and according to both dogs and owners, a lot of pure fun! 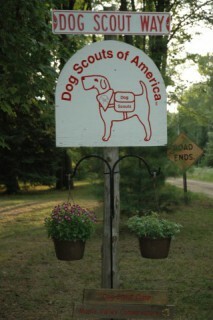 Check out the Dog Scouts of America. The website is loaded with great information and, if you don't have a chapter of DSA in your area, maybe you could start one!